Ford is working with Liverpool University to develop a laser-based ignition system purportedly more efficient than the tried-and-true spark plug. Plus, it'll only cost one hundred million billion dollars. Spark plugs as an ignition system haven't fundamentally changed since their invention: apply high voltage across a measured gap to produce a spark which ignites the fuel in the cylinder. 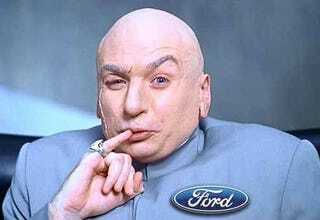 The laser-based ignition system Ford is working on makes that look like stone age technology. Lasers used in the same application can do more because there's the possibility of splitting the laser to provide multiple ignition points from the same source, improving ignition reliability. Not only can it do the fire-making job better, but a laser can be used as an active sensor, reflected laser light can be used to determine conditions in the cylinder in real time.